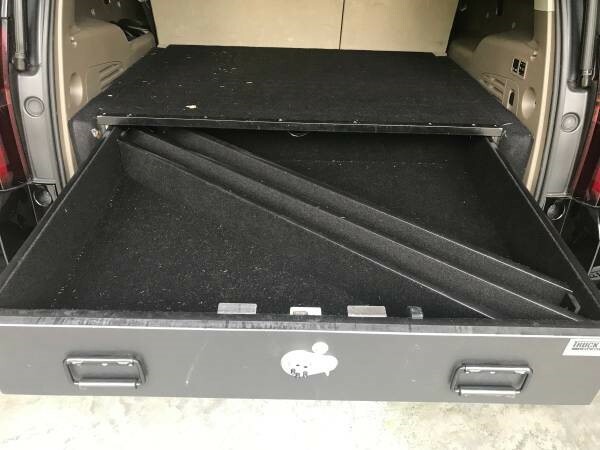 FOR SALE: Truck Vault Secure Storage Solution System This Truck Vault is currently in my 2017 Suburban. Before that I had it in my 2015 suburban. 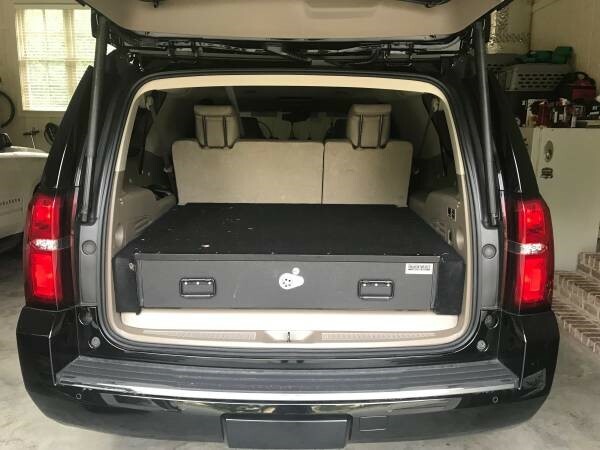 This unit was custom built for me to fit exactly in the back of my Lexus GX 460 (the Highlander size). I have built these spacers that you can have to make it fit into your Suburban. The dimensions of the Truck Vault box itself are 43 1/2 inches wide, 35 inches deep and 9 inches tall. Inside the drawer has two full length diagonal dividers which accommodate 2 x 28 inch or less fire arms. The interior drawer is 31 1/2 inches deep, 40 1/4 inches wide and 6 inches tall. The Dividers are 4 1/2 inches tall. It's heavy - it has tie down cleats on the back to tie it down so it won't slide out but I have never had to use them. Takes two people to move. 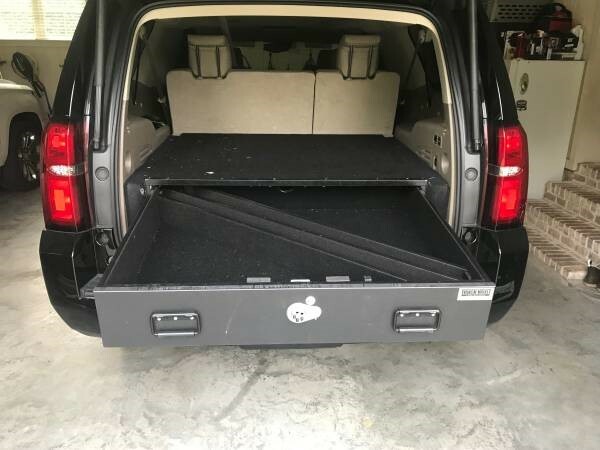 Here is what the Truckvault.com website says about this product:"TruckVault has been in business since 1995 and is recognized worldwide as the leader in the secure in-vehicle storage solution market. Our mission statement is simple, “Manufacture and sell superior quality secure storage and logistics support solutions to Public Safety officials, Businesses and Outdoor Enthusiasts and back this up with constant product improvement processes, a limited lifetime warranty and a dedication to customer service that is unrivaled.” This has served thousands upon thousands of happy customers well.TruckVault has a solution for every secure in-vehicle storage need whether it be for a Pick-up, SUV, Sedan, Van or any other vehicle on the road today. In addition to our vast array of stock designs, we also work meticulously with you on your custom needs. Our team of highly skilled Territory Representatives will walk you through every step of the process to ensure you get the product you need to tackle your tasks. We take great pride in our products and the quality they represent. Thanks for taking a look. 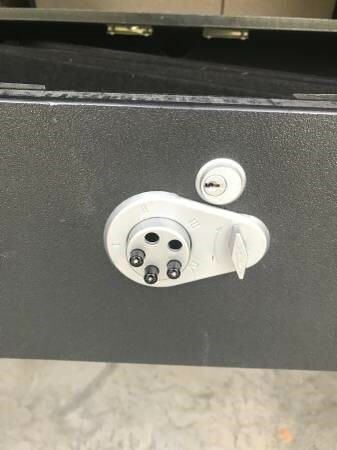 "These things sell from 1200-1600 at the Truck Vault.com/Outlet website. I will sell this one for $950 and throw in the spacers so you can make it fit in your SUV.